18th Hussars or "The Drogheda Cossacks"
Hussars of Conflans - Tail, rather than teeth. I was wombling about the house the other day when I ran into Mrs Kinch. This is not, you understand, a remarkable occurrence. What was remarkable was that she was singing a version of "The British Grenadiers" that her great uncle had taught her. For those who are interested, the lyrics follow. Give three cheers for Kruger! To hell for the Queen! Because we're all for General Kruger! And there you are Reverend. One of the oddities of my collection, along with the shocking lack of Grenadiers of the Guard (sorry John), is that I'm very fond of camp followers, surgeons, vivandieres and all those other hanger on types. Admittedly, I have scaled that back somewhat as I have rather a lot of them at this stage. The Drogheda Cossacks had a reputation for looting and pillaging, but lest we forget someone had to carry the loot, so allow me to present the official "hangers on" of the 18th Light Dragoons. A young chap leading some cows, stolen no doubt. I'm not au fait with the history of dairy farming in Spain, so I have no idea if the Freisian is appropriate for the Iberian peninsula. Figures from IMEX's American Pioneers set and painted by Mark Bevis and Graham Tormey. Another stolen piece of equipment, this time an Italeri French supply wagon accompanied by a metal figure that I think was made by Uwe Emke, but I'm not sure. 1. As objectives, players have to attack/defend a wagon train, seize a particular person, etc. Seizing the French baggage train at Vittoria would be one example from the period. 2. As terrain, you can use civilians as a means of clogging up roads, complicating movement in urban areas and generally not doing what they are told. 3. As a source of intelligence. Players in my games have learned that I rarely place civilian figures on the table for no reason, they can be an invaluable source of information on local fords, where the enemy has been in the area, etc. Two examples of this sort of thing that I'm rather proud of. a) A player observed that there was a hut on one side of the river and that there was a shepherd and some sheep on the other side. Divining correctly that a shepherd would be unlikely to traipse around to the bridge, he went looking for a ford between the shepherd and his house. b) There were two built up areas on the board. One was populated with civilians and the other deserted. The player worked out that of the two built up areas, the ambush which he suspected had been set was most likely in or near the deserted town. The 18th Hussars was one of five regiments of light cavalry raised in 1759 and was known as the Drogheda Light Horse after their Colonel, Charles Moore, Earl of Drogheda. The regiments was clothed as hussars from 1807 and were bound for Portugal the following year. They fought with Moore in Spain and having been involved in several sharp skirmishes; they were to shoot their mounts at Corunna. Allan Mallinson describes their predicament with feeling in Rumours of War. Astute observers, however, will notice that this squadron is a man short. Some of my hussars have disappeared during the move or more likely have been misfiled in other boxes. At least that's what Mrs Kinch says - I presume they've gone in search of drink. The slightly smaller squadron suits C&C: Napoleonics though as they fit more easily in a hex and on the five inch steel plates I use as bases. The figures I've used for the 18th are a mixture of Esci Lord Cardigan's 11th Hussars and Italeri British Light Dragoons, though the two sets are closely related. The 11th Hussars set is obviously for the Crimea, but one of the advantages of there being little change in British cavalry fashions between the Peninsula and the Crimea is well, there was very little change. They seemed to fit the pictures of the 18th that I'm familiar with, the only lapse that I can see is their lack of plumes. But they do have pelisses and as far as I'm concerned, the pelisse maketh the man. The 18th cannot be described to have had a particularly good Peninsula, in fact they were known as "The Drogheda Cossacks" because of their devotion to looting. I feel that this is a little unfair as I do not believe that they were untypical in this. Their main mistake was breaking the 11th commandment, "Thou shalt not get caught." They had done very creditable service at the battle of Vittoria and it was towards the end of the battle that several troopers of the 18th were caught by Lord Wellington drunk and looting in the streets of the town. A trooper of the 18th, Corporal Fox, took Marshall Jourdan's baton - but didn't care much for the shaft, just unscrewing the gold caps. It was later reassembled and presented to the Prince Regent. 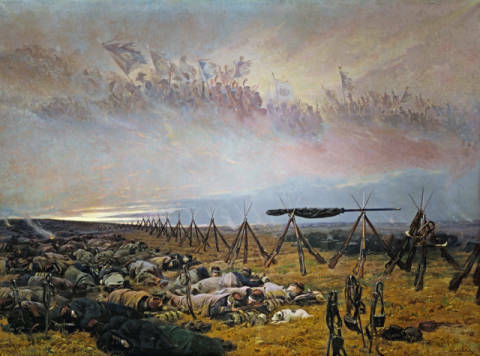 Wellington was scathing, "...the 18th Hussars are a disgrace to the name of soldier, in action as well as elsewhere.."
This was more than a little harsh, as the majority of the regiment were still engaged in the pursuit. They soldiered on until Napoleon's abdication, but they were to get only one battle honour for their service in Spain; Peninsula. They picked up another at Waterloo and Colonel Murray was later to be one of Sibornes correspondents. ...and in no kind of formation and the officers aren't at the right of the line. What was I thinking? These fellows make up three British Light Cavalry units in my Command & Colours: Napoleonics army or one Charge! regiment. Now that they are photographed, I'll have to add them to metal bases. At the moment, I'm toying with the idea of adding name tags at the back, but that's a post for another day. *All details shamelessly nicked from Mike Chappel's "Wellington's Peninsula Regiments: The Irish" from Osprey. Better men than I have reviewed Mark Urban's "The Man Who Broke Napoleon's Codes" - so I shall give but the briefest of summaries. Suffice to say that it's a splendid book, buy a copy and anything else by Mark Urban that you can find. Essentially, there was a chap called George Scovell, who was a very talented officer - a gifted logistician and cloak and dagger expert who longed to be a dashing commander of cavalry. French couriers were routinely captured and their messages passed to the British during the Peninsular war, which led to the French making use of codes in order to conceal their communications. Scovell broke those codes and kept on breaking them, keeping Wellington informed of what his enemies were doing. I regret to say that Wellington treated Scovell rather shabbily - not something that sits well with my admiration of the Duke, but there you are. However, Scovell did manage to accomplish his ambition of commanding cavalry and that is where the Cavalry Staff Dragoons come in. He had nothing to do with the Scoville scale. Entirely differant Scovell, I assure you. The Cavalry Staff Dragoons were raised in 1813 and they formed the first unit of formal military police in the British army. So far as I'm aware there were Provosts, but I haven't been able to dig up much information on them. As well as policing the army, the Cavalry Staff Dragoons escorted senior officers and carried messenges. I haven't had much luck finding nice ADC figures for my British army, so I decided that the Staff Cavalry Corps would fill the gap. As regular readers will know, military police are a subject close to my heart. The dragoons eventually reached a strength of four squadrons and apparently did some service in the line of battle, according to Wikipedia, though I've been able to find no reference to it elsewhere. I happened to have some Strelets Crimean era Light Dragoons knocking about the house, because I had bought the Strelets Balaklava set in a fit of madness a few years ago. I really like the figures, though I'm fonder of the lancers than I am of the Dragoons. I was at a loss as to what to do with them unless I wanted to raise a Russian army to face them*. Working on my usual "close enough for government work" rules of thumb, I decided that they would do for Staff Cavalry Dragoons on the grounds that the uniform hadn't changed that much and that the dragoons had been accoutred as light cavalry because that was the sort of thing that appealed to George Scovell. I wrote to Richard Borg a few weeks ago to ask about the Grande Bataille expansion for Command & Colours: Napoleonics. He very kindly gave me some advice about the upcoming expansion and how he runs multi-player games on a single board. I was thinking that allowing Leaders to have an attacked ADC that they may use to order a unit might be interesting - replacing the "Taking the initiative" rules from Memoir '44. The Staff Cavalry Corps would seem perfectly suited to this sort of thing. *Yes, I know it's the obvious answer - but really? Another horse and musket army? I read quite a number of wargaming blogs and often follow blogs for games that I don't play, if I think the authors ideas or enthusiasm warrant it. 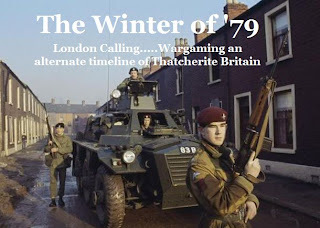 One such blog is Winter of '79, a blog based around a fictional British Civil War that takes place after the election of Margaret Thatcher. The project is built around 20mm Cold War era figures and takes its inspiration from a variety of sources; The Professionals, A Very British Coup, John LeCarre, the Miners strike and The Clash to name a few. 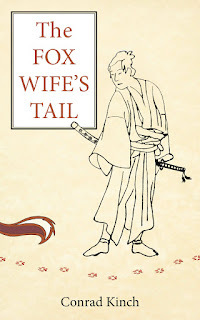 The author grew up during the period and often comments on things that he remembers noticing at the time, this makes the blog an interesting and oddly personal read. Not my typical fare - but well worth a look. Of particular note is Marks recent post about his "dream list" of 1970s British Civil War figures. Look at him, isn't he beautiful? A few weeks ago, we had some friends over for dinner, who brought me a rather nice 1/72 scale bull to go with my Spanish terrain. It was lovely and very thoughtful gift, though curiously enough it had something attached to it. Some of this actually. It seemed like a rather odd gift to give away with an admittedly rather expensive model bull, but it wasn't bad by any manner of means. We had to drink it of course, just to be sociable - you know how these things are. It turned out that our friends generosity knew no bounds, for they brought a second bull. This one is taking a rather more laid back approach to life. I suppose I should probably find my 1/72 scale cows. That should have him up and about. Now as regular readers of this blog will know, there are only two things I hate in this world; people who are intolerant of other cultures and the Dutch. I have had to overcome this particular foible in order to field appropriate troops for the Quatre Bras scenario in the Command & Colours rule book as not even the most crazed of chauvinists can say that Wellingtons army was an entirely British one*. Who says that wargaming doesn't broaden your horizons? I had originally decided to leave the two Hundred Days scenarios to one side for a while, but I was returning from court recently to discover that my local model shop had a box of HAT Waterloo Dutch Infantry. I quick calculation convinced me that if I was willing to forgo my usual habit of assembling troops in Charge! style regiments, I could assemble two infantry units from one box. I paused for careful reflection for two, possibly three seconds and then bought them. It appears that I'll have to muster some Brunswickers, Belgians, Nassauers and Hanoverians before I can actually play the scenario, but it is no great sacrifice. A box of Hats Dutch Belgians and Nassau troops should plug the gaps with very little difficulty. The Nassauers in particular are cracking figures. I shall have to get my copy of Mark Adkins "The Waterloo Companion" over from the old house before paint encounters plastic as beyond knowing that they were there and that Crown Prince William of Orange was an ADC in the Peninsula (thank you Georgette Heyer), I know scandalously little about their involvement in the battle. So, anyone for a schmoke and a pancake? *Down at the back, Hofschroer. See me after class. One of the drawbacks of not having your own wargames room is that it is often quite hard to tell what is and isn't in your collection. Taking a leaf from my pal, Donoghs book, I've decided to start a series of muster posts; the idea being to take out and photograph all the troops I have at my disposal. My photographic skills mainly lie elsewhere than photographing miniatures, but hopefully like all things in life, they will improve with practice. We'll start with the 60th Rifles (Royal Americans), specifically the 5th battalion. Originally raised in America during the Seven Years War, I haven't found any reference to them taking part in the American rebellion. These figures represent the regiment during its time in the Peninsula, where they regularly distinguished themselves, though by that time the number of American loyalists in their ranks was relatively small, with the majority of the men being Germans or other Europeans*. These are mainly Revell figures with a few other manufacturers mixed in. They form the entirety of my Rifle corps and were painted by Mark Bevis of Micromark, they form the entirity of my Rifle corps. You'll see the Colonel, RSM and Colonel's bugler deployed behind the supernumerary rank. A camp follower on the left leads the regiments two baggage animals. I've been unable to find any reference to Rifle battalions having pioneers, so I left them out. The three Charge! companies make up three Command & Colours Rifle units. This is probably rather more than I will ever need, but how can you have too much of something you didn't need in the first place? The rank and file are Revell British Riflemen with Italeri sergeants and officers. The Revell figures are slightly smaller, but there doesn't appear to be much difference once they're painted. The Italeri officers have pelisses, so far as I'm concerned this makes all the difference! The Colonel is a Waterloo 1815 Prince Billy. I couldn't find any mounted Rifle officers that looked distinctive enough for my tastes and I like this figure. I like to think of him as a mad old German coot whose leadership style revolves around hat waving, shouting and schnapps drinking binges the likes of which are rarely seen outside the better class of Norse saga. Judy O'Grady is a Uwe Emke figure, leading two 25mm Irregular Miniatures pack mules. I quite like both figures and as Uwe knows I have what my wife would call "...a strong weakness..." for Vivandiere and camp followers. The Irregular figures are probably a bit on the small side for 25mm, but work very well with 1/72 scale plastics. I like Irregular Miniatures, but their output can vary so much that I'm often reluctant to buy their larger figures unless there are pictures on the website. And that marks the end of my first muster post, I hope there will be many more. I can only hope that my photographic skills will improve and the next few won't be quite so rushed. *Though to be fair, the Germans and Swiss were always relatively heavily represented in their ranks. **Strictly speaking I know its nothing to do with the Royal Americans, but it is a Rifles march and it is American and frankly, you can't beat Souza. Chap was a bloody genius with a rumty te tumpty tune. 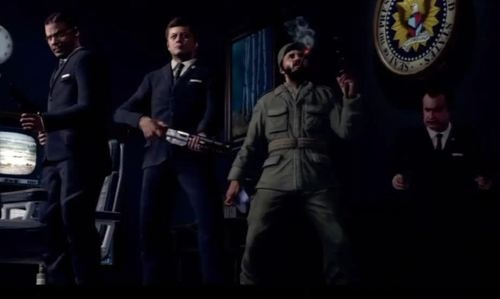 shooting zombies in Call of Duty: Black Ops. 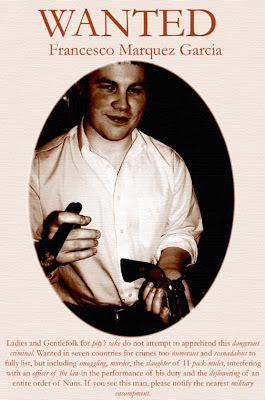 I have been reading with great interest a series of posts by Foy over at Prometheus in Aspic. He has been examining the difficulties and compromises attendant on making a game out of the grand tragedy that is human conflict. Pushing toy soldiers is a pretty poor simulation of battle, but it makes for a great passtime and one that has given me comfort, pleasure and good comradeship for many years. I have no doubt that the actuarial eye that Foy has brought to the problem is useful and helps tease out the situation. One of the lessons that Robert McNamara propounds in the documentary "Fog of War", a very fine piece of work, is "Get the data." He is of course, absolutely right. However, I am skeptical of the idea that getting the data is an achievable goal, particularly in a situation as chaotic and confusing as battle. I would argue that in some ways it is part of the human desire to know the unknowable, to catalogue and quantify in order that some of the terrifying unpredictability of life be taken away. This is an entirely understandable reaction and one without which the science that lights our homes, gives us clean water and heals us when we are sick, would be stillborn. We are better off for this impulse - but must be clear that it does not offer us a universal panacea and that constant revaluation is the price of progress. I dealt some time ago with a person who had been the victim of a serious assault. When talking to them, I realised that they were quite shaken by the experience and were still trying to make sense of it. What struck me about the conversation was that the person kept asking me what they had done wrong - as if the incident had been a punishment for a transgression. I think, and all I can offer is my opinion, is that this person was looking for a structure, a rule that they could abide by in future that would prevent this terrible thing re-occuring. Sadly, I wasn't able to put their mind at ease because they hadn't done anything wrong - it wasn't as if they had indulged in some manner of the risktaking behaviour; they had been going about their business as they had every right to do and were utterly blameless, legally or morally for what had occurred to them. Life had dealt them a bad hand that day and there was simply nothing they could do but learn to bear it well. I sometimes wonder if wargamers obsession with minutia and numbers is part of a desire to make sense of a chaotic situation that occurred many years ago, to achieve a feeling of control there that they lack in other aspects of their lives. I certainly get a great deal of pleasure from completing a collection or securing a hard to find figure. ...and if that isn't the personification of randomness, I don't know what is. Cavalry units have unsurprisingly enough a lot of horses and they place concomitant demands on supplies of horse shoes. While hussars are off dashing about sabring Austrians and bothering the local womenfolk, someone has to make sure that the beau sabreur's steed was capable of walking afterwards. I have a regiment of the Hussars de Conflans in my Napoleonic French army, organised on the Charge! model. I have something a love affair with the tail units in my armies; I have a plethora of baggage animals, wagons, camp followers and the like. That they serve no earthly use in a wargaming context is largely irrelevant, though I should really settle down and work out some means of using them in CCN. For those of you reaching for your copies of Digby Smiths Napoleon's Regiments you won't find them there. The Hussars of Conflans are from Sir Arthur Conan Doyle's Brigadier Gerard stories. Though on rereading the stories recently, apparently the Third Hussars are the Hussars of Conflans. Now as Molesworth would say, "...as ane foole no.." the Third Hussars were the Hussars De Esterhazy , but I think I prefer the historical Third Hussars uniforms which are rather fetching grey and red number. This means of course, that my Hussars of Conflans with their invented uniform (assisted by that clever fellow that runs Not by Appointment) may have to transfer to my Ruritanian forces and that I will have to get a new regiment of hussars. Courtesy of my friend and partner in crime, Icecream Cian. I have been treating the Command & Colours: Napoleonics scenario bank as a shopping list for my Peninsular War armies and assiduously filling out the spots that I haven't filled. One thing that I have discovered is that my artillery units, which all come with caissons and gun teams, have absolutely no chance of fitting in a five inch hex. The Foot Artillery units don't look too bad with just a gun and some crew, but I needed something to distinguish the Horse Artillery. I also needed some Horse Artillery. Well needed is probably a rather strong word, I certainly wanted Horse Artillery. I eventually settled on a gun with crew and a mounted officer to help distinguish the Horse from the Foot batteries. This is not so tough for the British, who have the decency to wear a different sort of hat, but more of a difficulty for the French, whose horse artillery look very "footy" to my eyes. I'm not sure of the ability of inexperienced players to distinguish between the two in the heat of battle. Enter Sean at Newline Designs stage left and I am now the proud owner of two complete sets of British and French Horse Artillery guns and crew with mounted officers to match. The British officers are actually Light Dragoons, who will have their swords trimmed and possible spy glasses or something similar added. They are nice figures and I'll post some pictures when they are painted, but I think I might try and find some officers with pelisses. There's just something about pelisses, don't you think? Observe the pelisse, gentlemen. Isn't there something about it that suggests that this fellow went to the right school, what? Dismounted French Dragoons by Hinton Hunt (by way of Kriegspieler), a HAT British Light Infantryman shown for scale. One of the other pleasures of John C's visit to Chateau Kinch was that he brought with him some Dismounted French Dragoons that he had got from the United States of America. I have something of a curious obsession with Dismounted Dragoons, having parted with a substantial amount of money for a Strelets set. I suspect that it may have something to do with the Sharpe novels that I read in my teens, which invariably focussed on the petit geurre aspects of the Peninsular War. French Dragoons were very competent anti-guerrilla troops, though their methods bear little praise. On a happier note, John's figures are ten beautiful little sculpts, quite small by modern standards and about the same size as Newline Design figures. They are Hinton Hunt figures, a name that never really meant anything to me until I read Achtung Swinehundt! The figures them selves are actually American copies by a company called Der Kriegspieler apparently, but I still think they are rather fine. I am very taken with these, so much so that I don't think I'll give them to my usual painter to be painted, these I think I will keep for myself. The size issue may be ameliorated somewhat after they are based, but I think my Italeri Dragoons have found some more dismounted company. There will probably be a size discrepancy, but I'm not sure I care. I can't say I know when I'll get around to them with my copious free time, but it strikes me that these are a pleasure to be sipped. For those of you who would like to learn a little more about Hinton Hunt and other old 20mm figures, should check out Vintage 20MIL. The Hinton Hunter run by Clive of the ever wonderful Vintage Wargaming blog which is also well worth a look. Last week was a great week for my gaming. Firstly, my frequent email chum John C came over from Wales for a look at Dublin and secondly, I finally managed a game of Command & Colours: Napoleonics in my new games room. It was the christening of the games room and things were a bit rough and ready, but the company made all the difference. As we've been experiencing a certain amount of difficulty on the domestic front with builders and other such persons of little consequence; the whole enterprise was a little more rushed than I would have liked, but the table held up. I don't actually have a wargames table yet, but I found a metal frame in the shed and that coupled with two doors from a wardrobe that I'd taken apart furnished a serviceable table. Not quite as sturdy as I would have liked (que much swearing and breaking of Lidl drill bits), but solid enough. John and I had an all too brief time in Dublin as he had to scurry back to Wales in relatively short order. We took in Collins Barracks, St. Patricks Cathedral, Christchurch Cathedral, Marshes Library, Trinity Library, the Garda Museum, Dublinia, the Chester Beatty Library and Dublin Castle. It was all a bit rushed, but I like to think that John got some idea of the city. My history as a tour guide came in handy. That and a trip around the bookshops (which John liked, but not the prices) rounded out the trip and back to home base for a game. Generals Gorman, McCarthy and Creanor were in attendance, so after a quick game of the Battle of Maida to get John used to the rules, we played the Coa scenario several times. Generals Gorman and Cunningham are unimpressed by these "zilly Eeenglesh"
We played the scenario four times and the French were hammered on each occasion, one of the most notable instances being here. For those of you unfamiliar with the battle, here is a rough idea of what occurred. Portugal is seperated from Spain by a large mountain range, in fact the existence of this mountain range probably has rather a lot to do with why Portugal isn't just more Spain. There are points where the range can be crossed, but unsurprising some enterprising fellow built a series of fortresses to guard them. In 1810, the British were falling back into Portugal after a disappointing showing in Spain. Marshal Massena was advancing and wished to take the fortress of Almeida as he had so lately taken Ciudad Rodrigo. A British General by the name of "Black Bob" Crauford had been given orders to hold the line of the river Coa and threaten Massena so that he couldn't take Almeida. Wellington gave him strict orders not to cross the Coa and not to engage the French, but Crauford went ahead and did it anyway; that he won is probably more due to the fighting qualities of his troops than anything else. Essentially the scenario as written for Command & Colours: Napoleonics is as follows, the outnumbered British must evacuate their position and get back across the river without taking too many casualties before they are crushed by superior French numbers. A slightly more grown up history can be found here. An RHA battery drives part of the French line back. General McCarthy is slightly pensive, perhaps Black Bob is in one of his moods again? As we had four players rather than the more usual two, we played a modified version of the Memoir '44 Overlord rules, officially known as making it up as we go along. Shortly after Messrs Creanor and McCarthy had made the goodbyes we realised that the layout of the scenario was incorrect and that the British had three more light infantry units than they ought to have had. As light infantry are very powerful troops (these were the famed Light Division after all), this may have contributed to the thrashing the French received. A final replaying of the scenario as written resulted in a French victory at a decidedly more even 4-6, rather than the 9-0 savaging they received first time around. Fortunately it meant that our guest managed to take one win away from the table, though it must be said, he took defeat like a gentleman. A wonderful evening and I hope only the beginning. I have returned from a road trip to Wales with an old friend. 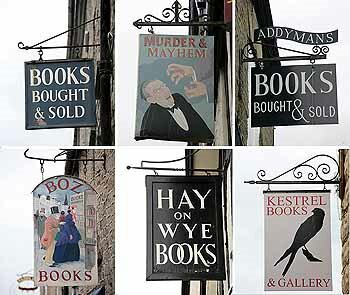 We had been discussing going to Hay-on-Wye in Wales for years and finally took the plunge last week. 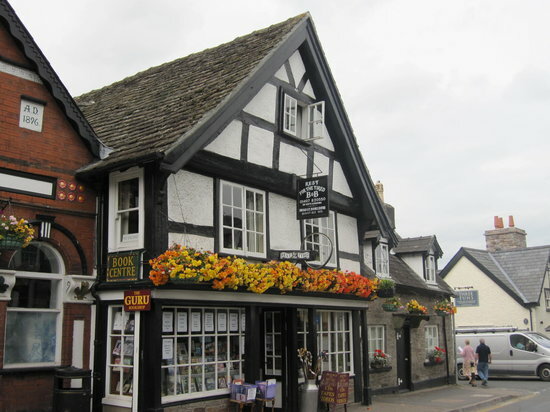 For those of you not in the know, Hay on Wye is a town of 1,500 people on the border between Powys and Herefordshire which has thirty one bookshops. I haven't been to Heaven, but I'm reasonably sure that it will bear a more than passing resemblance to Hay on Wye. We took the ferry over on Monday night and after an overnight at a Travel Lodge and a detour to HarlechCastle (pictures in another post), managed after a longish drive to get to Hay. Matters were complicated somewhat by the appearance of every road worker currently employed in the United Kingdom being in our way leaning on shovels and generally being an impediment. We arrived in Hay and made camp at Rest for the Tired, an extremely friendly B&B run by a lady called Mary, who makes an excellent fried breakfast. The B&B is right over the Book Centre which is well worth a look. We only really had one full day in Hay, so most of it was spent scurrying from book shop to book shop laden with treasures. - The Book Centre - large military history section and an extensive collection of Ospreys. Also where I picked up a first edition of Donald Featherstones Naval Wargames. - The Hay Cinema Bookshop - huge selection, very impressive on turn of the century adventure stories and anthologies, military history section not to be sneezed at. I left this shop with many regrets for "...the one I left behind me." They have a wholesale section in an industrial estate on the outskirts of town, though it's not really worth the walk. - The Addyman's Annex - not as big as HCB, but some finds. - Hay Castle Books - A bookshop in a castle, what could be finer? Not as comprehensive as the others, but some nice prints and very reasonably priced. I picked up an etching of of Detaille's "La Reve" for a song. - Booths - Hays largest bookshop. This is quite overwhelming. I was having a look at their military history section and counting myself very lucky, when I realised I was just looking at the "New Aquisitions" section and there were stacks and stacks more to explore. There were a couple of great finds, which I'll get to in another post. I'm really quite behind on my posting at the moment, mainly due to having pots of things on at the moment. More tomorrow, Scouts honour!